On this date in 1932, Korean nationalist Lee Bong-chang was hanged at Ichigaya Prison for attempting to assassinate Japanese Emperor Hirohito. The would-be assassin under arrest. Lee’s hand grenade targeted the wrong carriage, and didn’t even kill the occupants of that conveyance — it just injured a guard. A second grenade failed to explode altogether. 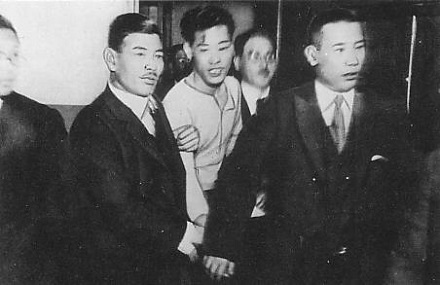 Three months after Lee’s attempt, another Korean, Yoon Bong-gil, also tried to murder Hirohito with a bomb. Both men are interred with garlands at Seoul’s Hyochang Park. A statue of our man Lee, poised with a grenade in hand, stands in the park. * Newspapers in China — also under Japanese occupation — expressed regret that Lee’s attempt had missed its mark; this impolite language helped to catalyze a Japanese show of force later that month known as the January 28 Incident or the Shanghai Incident. Yoon did not target HIrohito, but a gathering of Japanese military officials in Seoul celebrating Hirohito’s birthday. He too was sentenced to death and executed in Dec., 1932.